Asian markets were mixed Monday. China's Shanghai Composite Index sank 1.9% to 2,781, and Japan's Nikkei 225 Index rose 0.8% to end the day at 10,356. The Hong Kong Stock Exchange was closed for the Christmas holiday. 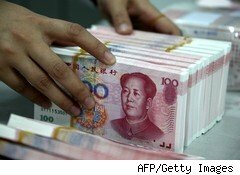 Beijing's Christmas gift to the country's banks was a 25-basis-point hike in the one-year base lending rate. This is the second time in a little more than two months that the bank has made such a move, bringing the rate to 5.8%. Even more tightening could follow, considering the government's need to cool the country's sky-high inflation. "We expect more to come in 2011, forecasting another 75 basis points of rate hikes by the end of next year," Brian Jackson at RBC Emerging Markets told the Financial Times. Although the boost was no surprise to investors, profit-taking sent shares in Chinese banks spiraling. Bank of Communications tumbled 1.9%, China Construction Bank slumped 1.3%, Agricultural Bank of China and China Minsheng Bank both slid 0.8% and Industrial & Commercial Bank of China slipped 0.7%. The knock-on effect of the higher lending rate crippled real estate shares, sending China Vanke plunging 2.9%, Gemdale sinking 1.2% and Poly Real Estate down 0.9%. It wasn't all bad news. Investors in Guizhou Panjang Refined Coal were rewarded as shares shot up 6.8% on the news that government-owned companies signed contracts worth about 300 billion yuan ($45 billion), according to Bloomberg. And coal prices hit a seven-week low, thanks to recent stockpiling at Chinese ports in expectation that dramatically low temperatures during the winter months will spur demand and raise prices. In Japan, promising negotiations between several high-tech companies helped boost shares in the chip sector. Elpida surged 1.6% after rumors that it's discussing a deal with Powerchip Technology, a Taiwan-based chipmaker. Hon Hai, the Taiwanese maker of popular consumer electronics including iPads and iPhones for Apple (AAPL) and notebooks for Dell (DELL) is reportedly discussing scooping up more shares in Hitachi Displays to the tune of about $1.2 billion. Canon and Hitachi, both shareholders in Hitachi Displays, saw their share prices affected. Hitachi advanced 0.7%, while Canon retreated 0.7%. Other Japanese winners included Alps Electric, a maker of electronic parts for the auto industry, which zipped up 3.5%; tool manufacturer, Okuma, which jumped 3.3%; Casio Computer, which surged 2.1%; and semiconductor-testing company Advantest, which rose 1.5%.